The other day I got a direct message from Jeff Bullas. I was excited. Jeff has a great blog jeffbullas.com that gives a lot of good blogging and social media advice. He’s a Forbes Top 50 Social Media Power Influencer, has written books and speaks and consults. His blog gets over 4 million page views a year. Jeff’s direct message on Twitter said, “Thanks for following me. I look forward to following your tweets.” With over 225,000 Twitter followers I responded, “I am impressed that with so many followers you do this.” I was looking forward to a conversation, but here it is 10 days later and I have not received a response. 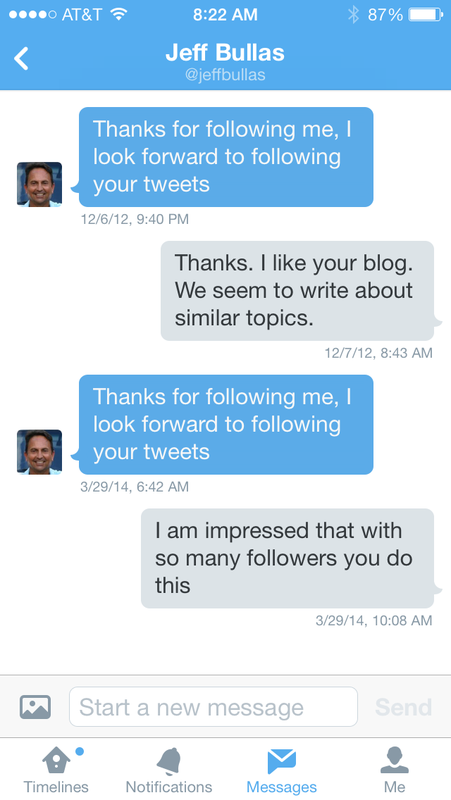 Then I noticed that Jeff sent me a direct message before (see below) two years ago with the same exact message. Back then I was also excited to start a conversation, but as you can see he never responded then either. Is Jeff really “looking forward to following my tweets” if he won’t respond to two DMs he initiated? Are my expectations off? Other top social media influencers have decided to reduce or stop their engagement, becoming more like traditional publishers. I love Seth Godin and use a lot of his material in my classes. Unleashing the Ideavirus is a classic that is still very relevant today, but Seth doesn’t allow comments on his blog. He explains why here and he makes a lot of good points for him. 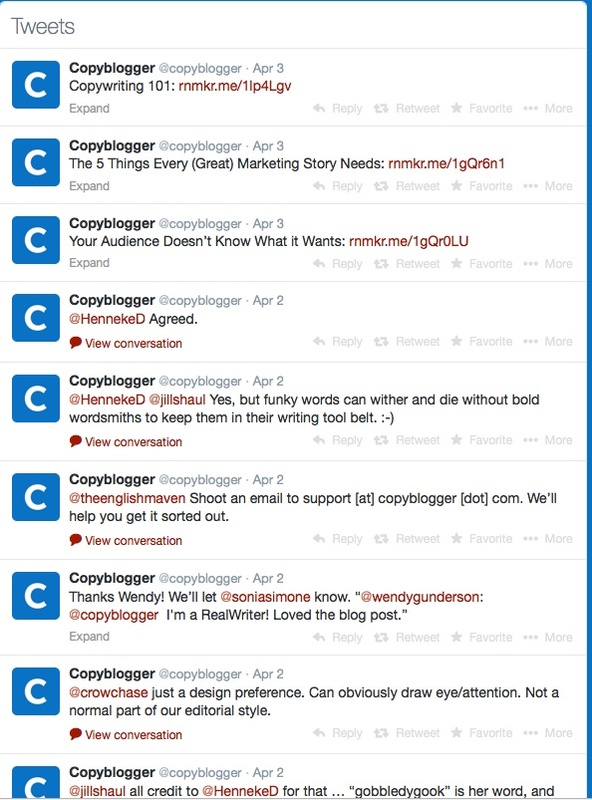 Then there is Copyblogger getting rid of comments. They just wrote a post explaining “Why We’re Removing Comments on Copyblogger.” They say the conversation has moved to wider platforms such as Facebook, Twitter, Google+ and LinkedIn. They say people put too much effort into great comments on their site and should instead put that effort into their own website. They say they have spent way too much time sorting through the spam – only 4% of comments get posted. This change is a pretty big deal. I was curious to see the reaction to this big announcement, but they removed comments. Instead they encourage me to let them know my thoughts about the change on Twitter. So I clicked on the link and went to Twitter. Just 12 days later that discussion is lost in a sea of unrelated topics, conversations and blog post promotions as you can see below. If I scroll down the Twitter stream back to March 24 I do see comments about getting rid of comments, but this seems like a lot of work. At least on the blog all the comments under the post are focused on that topic and do not get lost in everything else. I also appreciate their efforts to weed out the spam, so the comments and conversation is of a higher quality. Moving to Twitter gives up all that control and opens up the floodgates of spam. Besides, I was already on their blog and wanted to talk specifically about that topic. Isn’t copyblogger owned real estate versus rented? Don’t they want to drive people there? Don’t comments help with SEO? This is all the questions I would have liked to ask on their blog, but I suppose I am taking their advice and writing it here on my blog instead. Less social engagement from social engagement innovators. Is this simply where we are headed? As the innovators of social media engagement get too big, they simply must engage less? There just seems to be something weird about telling others to engage more while you are engaging less. This brings me back to my title. Ted Rubin was just named #13 on the Forbes Top 50 Social Media Power Influencers of 2013 (Just two down from Jeff) and he has over 196,000 followers on Twitter (the most followed CMO on Twitter). In 2013 he published a book with Kathryn Rose Return on Relationship, which is the value that is accrued by a person or brand due to nurturing a relationship. 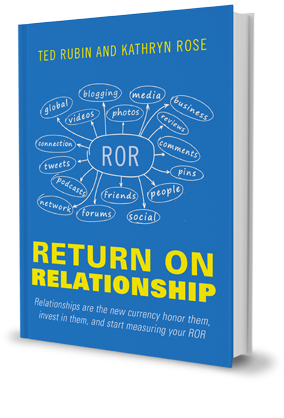 ROR is the value (both perceived and real) that will accrue over time through loyalty, recommendations and sharing. Ted Rubin is a busy guy, but he is living what he is preaching. I have had several conversations with him on different social media platforms, and he has even commented on this blog. Thanks Ted. Still are my expectations off? Ted does wear Superman socks. Ted’s not the only one, there are a lot of social media innovators out there like Michael Stelzner who I know are still very active and engaging with their audiences even as they grow. Tags: Bloggers, Blogging, Blogs, Content, Copyblogger, Digital Marketing, Engagement, Facebook, Forbes, Google, Ideavirus, Jeff Bullas, Keith A Quesenberry, Keith Quesenberry, LinkedIn, Marketing, Media, PR, Return on Relationship, ROR, Seth Godin, Social Media, Social Media Influencer, Ted Rubin, Twitter | Permalink. Great entry!…really makes you think about all the time we spend online in social media…the buzz now is about how consumers and everyday bloggers have taken the power away from companies via social media, and to some extent that is very true…but the limitations of this newfound power regarding what you just blogged about above will always exist — all of us only have so many hours in a day to spend on the internet responding and commenting to all the gazillion other people on the internet…and, formulating meaningful discussion and analyses takes more time even still (indeed, while I am crafting and typing this up, I see my kids out in the yard waiting for me to ride with them around the neighborhood! )…from which blogger should I take advice?…which advice on the internet is sound vs. an armchair opinion?…it all circles back to credibility, credentials, & quality, all three of which are only gained through mostly traditional channels (even if those channels morph into seemingly new forms)…Jeff Bullas may have miscalculated the valence effect of his automated response to you, but I don’t really blame him at all — a gazillion people (us included) want him to personally respond to them, and for a very short moment in time, his automated response gives us exactly that — a warm rush of emotion that is very (very) short-lived. Thanks for your comment Mike! I look forward to reading your future comments. Good points. I wrote a post a while ago about the social media command centers springing up and unrealistic expectations of 24 hour response. I’m going to enjoy this beautiful weather myself. See you in the park! Great post Keith, and right on point. Not very fond of those automated DM’s myself, especially if they imply something that’s not happening. Relationships are like muscle tissue… the more they are engaged, the stronger and more valuable they become. Thanks, Ted. Use all the social media dashboards you want, but there still has to be a human with that update, post and tweet investing time into the customer relationship. I suppose that’s why social media community managers have become such an important position at startups and Fortune 500s alike. P.S. If you are not engaging, it’s not social, it’s simply publishing in a format that allows for user-generated syndication. That’s ok, but don’t call it social.